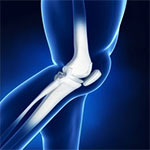 Arthritis : Can Vitamin Combo Curb Knee Pain? Summa Health System is exploring whether its patented combination of vitamins can curb the inflammation and pain experienced by some patients after knee-replacement surgery. Summa's Walter A. Hoyt Jr. Musculoskeletal Laboratory recently opened a clinical trial for Apatone-B, an oral medication that contains vitamins C and K3. The vitamin combination originally was developed by Summa researchers to help treat cancer by making the tumor cells weaker and more susceptible to chemotherapy. But when Summa's cancer researchers were discussing the drug during a research meeting, Summa's orthopedic researchers began to suspect lower doses of the medication also could work for joint-replacement patients who are experiencing inflammation and pain. All replacement joints generate wear particles, said Dr. Thomas F. Bear, chief of staff of the Crystal Clinic Orthopaedic Center and principal investigator for the study. Most people don't have reactions to these particles, but some patients experience unrelenting swelling and pain. Less than 10 percent of the 1 million Americans who undergo knee or hip replacement surgery each year have long-term inflammation and pain that's not associated with infection or improper placement of the new joint, Bear said. Eventually, the reaction can cause loosening of the implant. Apatone-B is believed to work by shutting down the mechanism that controls inflammation and bone breakdown. "If this really works, every single patient with a joint replacement ought to take one of these pills with their vitamins every single day, whether you have a totally asymptomatic joint or not," Bear said. "The potential here is pretty amazing." Summa wants to enroll 60 people in the trial, which is open to patients experiencing inflammation or pain a year or longer after knee-replacement surgery. During the 13-week trial, half of the enrollees will receive an oral dose of Apatone-B and the other half will receive a placebo. The study is double-blind, meaning neither the enrollees nor the researchers will know who is getting the actual medication and who is receiving a placebo. Blood tests and samples of the fluid surrounding the affected joint will be taken at the start and conclusion of the trial to assess Apatone-B's effectiveness by comparing the level of inflammation and bone loss. Kathleen Gatian, 57, of New Franklin, recently enrolled in the study after experiencing pain in both of her knee replacements for the past five years. "I have great mobility, but it still hurts," she said. "I'm frustrated. I know many people who have had total knee replacements and they're doing fine." Gatian said she's excited about the possibility of taking vitamins to relieve her symptoms.